After selling out on January 19, DC Comics is sending INFINITE CRISIS #3 back to press for a new printing! Scheduled to arrive in stores on February 15, the INFINITE CRISIS #3 Second Printing (DEC058117) reprints the story written by Geoff Johns, and illustrated by Phil Jimenez, Andy Lanning, George Pérez and Jerry Ordway. 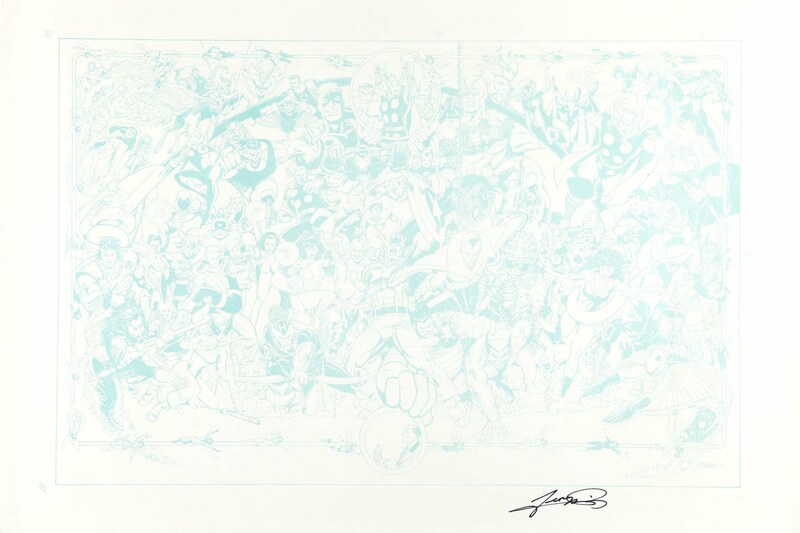 This printing features a pencils-only version of the issue's cover by Jim Lee. "I'm extremely grateful to be working on this project with so many talented people," says Johns. "Phil, Andy, George, (colorist) Jeromy Cox, (separator) Guy Major, (Group Editor) Eddie Berganza, (Senior VP - Executive Editor, DCU) Dan DiDio, (Assistant Editor) Jeanine Schaefer, (Coordinating Editor) Ivan Cohen, Jim Lee, Jerry Ordway, Greg Rucka - everyone who has been a part of this team has just been amazing. I'm glad there are a lot of people out there enjoying the series. Issue #5 has more surprises and turns - it's the calm before the storm of issues #6 and #7." The INFINITE CRISIS #3 Second Printing (DEC058117) is available for order now and is scheduled to arrive in stores on February 15 with a cover price of $3.99 U.S. To ensure delivery on that date, retailers must place orders by Sunday, February 5; please note that quantities will be limited and may sell out before February 5. Retailers may order the issue by contacting their Diamond Customer Service Representative or DC Sales Representative, or by email at reorders@diamondcomics.com. INFINITE CRISIS #1 (AUG050205) and 2 (SEP050228) are available for reorder. INFINITE CRISIS #4 is sold out. INFINITE CRISIS #5 (DEC050244) is available for advance reorder and is scheduled to arrive in stores on February 22. INFINITE CRISIS #6 (JAN060300) is solicited in the January Previews (Volume XVI #1) and is scheduled to arrive in stores on April 5.